Now that you've gotten familiar with the Tools you have on your Desktop it's time to apply that knowledge into making a Text graphic. Don't forget that it's best to have Photoshop open in another window and toggle back and forth while you work your way through these tutorials. You should make sure that you have the Auto Kern and the Anti Aliased boxes checked. Once you've made those decisions, place your Cursor in the area at the bottom of the window and type the text you want. When you are finished click OK and the Text will appear on your Canvas. Use the Move Tool to position the Text on your Canvas. To change the color of the text you will have to choose a Foreground color. If you look on the bottom of the Tool Bar you will notice two colors selected. The one on the top is the Foreground color and the one on the bottom is the Background color. You can refine your color choice from the Color palatte. 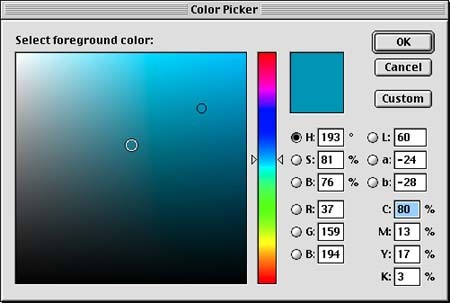 Or if you double click on the Foreground/Background colors, the Color Picker window will appear. You can choose a color by moving the 'circle' in the window. Once you have picked the color of your text, and placed your text on the Canvas it's now time to Crop the image to the size that you want. Draw a box around the text with the Cropping Tool place the cursor in the middle and click to crop your image. If you need to resize the box you can do that by clicking and dragging on one of the Handles . You now have a cropped text image. Before you save this image you will need to Flatten the layers. Now go under Image and change the Mode from RGB to Indexed Color. You should choose to save this image as Web Palette. You now have an Text Image for your Web page! Pick up the Eyedropper on the GIF89a Export and click on the background color. This color will now be transparent in a web browser. Congrats! You've now created a text image for your web page!